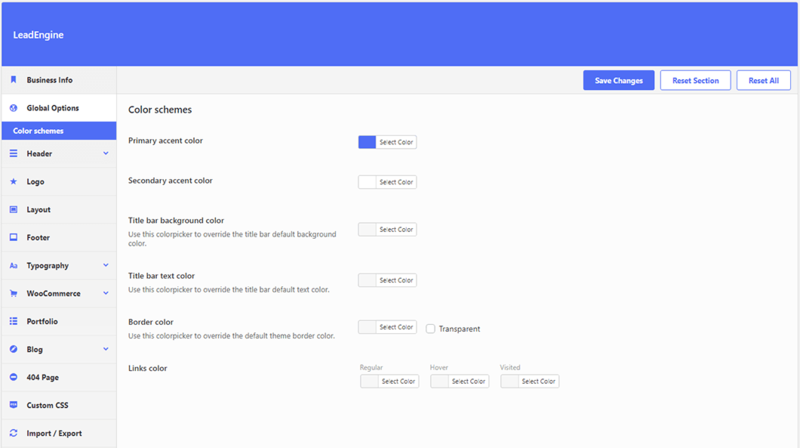 Primary accent color – option for setting the primary color of the theme. If not set, it will pick the theme default color. Secondary accent color – option for setting the secondary color of the theme. If not set, it will pick the theme default color. Title bar background color – select the background color used for the single pages title bar section. This option can be overwritten in the page “Title Section” metabox. Title bar text color – select the single page title color. This option can be overwritten in the page “Title Section” metabox. Border color – site-wide border color for all elements. This color option can be overwritten in the Settings panel for each element. Links color – Normal, hover and visited states of a link.